American palaeontologist who specialized in anatomy and particularly in dentition (the development of teeth), in fish and mammals. 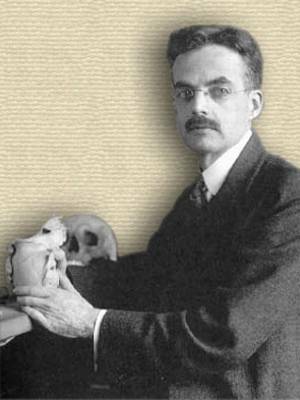 He planned exhibits at the american Museum of Natural History and wrote several books. As long as museums and universities send out expeditions to bring to light new forms of living and extinct animals and new data illustrating the interrelations of organisms and their environments, as long as anatomists desire a broad comparative basis human for anatomy, as long as even a few students feel a strong curiosity to learn about the course of evolution and relationships of animals, the old problems of taxonomy, phylogeny and evolution will gradually reassert themselves even in competition with brilliant and highly fruitful laboratory studies in cytology, genetics and physiological chemistry. 'Genetics Versus Paleontology', The American Naturalist, 1917, 51, 623. Perhaps the majority of paleontologists of the present time, who believe in orthogenesis, the irreversibility of evolution and the polyphyletic origin families, will assume that a short molar must keep on getting shorter, that it can never get longer and then again grow relatively shorter and therefore that Propliopithecus with its extremely short third molar and Dryopithecus its long m3 are alike excluded from ancestry of the Gorilla, in which the is a slight retrogression in length of m3. After many years reflection and constant study of the evolution of the vertebrates however, I conclude that 'orthogenesis' should mean solely that structures and races evolve in a certain direction, or toward a certain goal, only until the direction of evolution shifts toward some other goal. I believe that the 'irreversibility of evolution' means only that past changes irreversibly limit and condition future possibilities, and that, as a matter of experience, if an organ is once lost the same (homogenous) organ can be regained, although nature is fertile in substituting imitations. But this not mean, in my judgement, that if one tooth is smaller than its fellows it will in all cases continue to grow smaller. 'Studies on the Evolution of the Primates’, Bulletin of the American Museum of Natural History, 1916, 35, 307. 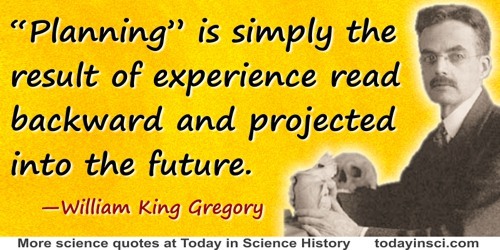 “Planning” is simply the result of experience read backward and projected into the future. To me the “purposive” action of a beehive is simply the summation and integration of its units, and Natural Selection has put higher and higher premiums on the most “purposeful” integration. It is the same way (to me) in the evolution of the middle ear, the steps in the Cynodonts (clearly shown by me in 1910 and by you later in Oudenodon) make it easier to see how such a wonderful device as the middle ear could arise without any predetermination or human-like planning, and in fact in the good old Darwinian way, if only we admit that as the “twig is bent the tree’s inclined” and that each stage conserves the advantages of its predecessors… The simple idea that planning is only experience read backward and combined by selection in suitable or successful combinations takes the mystery out of Nature and out of men’s minds. Letter to Robert Broom . In Ronald Rainger, An Agenda for Antiquity (1991), 238. 19 May - short biography, births, deaths and events on date of Gregory's birth.